An ideal bathroom should be like a good Zen koan - simple, clear of all ornamentation, yet as efficient and beautiful as any work of true artistry. While you may not come out of your bathroom enlightened or a step closer to Nirvana, you can find some inner peace with a design scheme inspired by the most relaxing design concepts of the Far East. If you're looking for Zen-like bathroom décor, you'll want to choose carefully. After all, much of Zen Buddhism revolves around ascetic (and aesthetic) sparseness. Clean lines, limited ornamentation - just the essentials. But there's no reason those essentials shouldn't be top of the line. 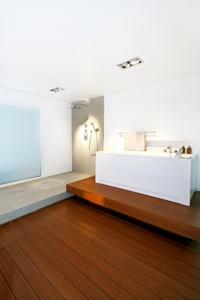 Quality and efficiency should only add to your meditative bathroom experiences. Consider these great options for your bathroom. 1. Wood flooring, wood walls. As attractive as marble or tile may be, they lack the simplicity of wooden planks. Consider investing in a sustainable and renewable wood resource. Bamboo is both of these and will help complete the Eastern style. 2. Uniform color. Stark white isn't a particularly Zen tone, and neither is anything else quite so bright. Pick a simple neutral tone, but keep it earthy. A mossy green could be good, or consider staining your wood floors and walls a rich brown hue. 3. One small mirror. As a functional adult, you'll need to check that your teeth are brush and hair is combed each morning, but keep mirrors to a minimum. One small looking glass over your sink should be enough. 4. Simple shelving. While most of your toiletries can be kept in a linen cabinet or vanity drawers, consider having a little wall shelving - simple planks - for a decorative item or two. A small, jolly Buddha figurine may be a nice reminder to smile and enjoy your day. 5. Rolled white towels. There's nothing more unassuming than a simple white bath towel rolled cylindrically. Stock up on these to bring a stylish and easy austerity to your Zen bathroom. 6. Potted ferns. While concentrating on your oneness with the natural world, let a little of it into your bathroom. A few potted ferns on the floor or shelf will improve air quality while also beautifying the room's aesthetic.